Job Shadowing: Students should be in 9th grade up through their senior year of college. It consists of a one-time, 2 to 3 hour visit, to shadow one of our veterinarians as they go through part of their day. Second Year Tech Students: This is for students who are in their second or third year of the Veterinary Technician program at The University of Maine at Augusta. This program consists of the required hours set by UMA and is typically spread out over 6 weeks. This time is spent specifically shadowing our technicians as they go about their daily routines. During this time the student will get to see what technician’s job entails and have the opportunity to ask questions as their class requires. Fourth Year Tech Student Externship: This is for students who are in their fourth year of the Veterinary Technician program at The University of Maine at Augusta. 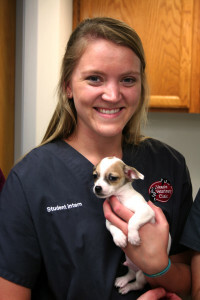 This externship consists of a seven week period of working at Veazie Vet for a minimum 32 hours a week. During this time period the student will spend time in all the areas of the hospital working as a technician. Weekly meetings are held with a mentor and supervisor to assess how their skills are coming along and to answer any questions that they may have. Pre-Veterinary Internship: This program is designed for students enrolled in a pre-veterinary undergraduate program who intend to apply to veterinary school. It is important for applicants to be certain this is an appropriate career choice prior to committing to the rigors and expense of veterinary school. Time commitment and duration of the internship will vary based on the students and clinic’s schedule and needs. All interested students must participate in our job shadow experience prior to being able to arrange any type of a longer commitment. Fourth Year Vet Student Clinical Rotation: This opportunity is for students who are in their final year of (post-graduate) veterinary school. Students spend a designated amount of time (typically two to three weeks) here working one on one with our veterinarians. Students are generally paired with one specific doctor but do spend time learning and shadowing the others as well. The focus for the student is on both small animal practice as well as the management side of running a high functioning veterinary clinic. If you are interested in taking advantage of any of these opportunities, or have any questions about them, please contact us at (207) 941-8840 or email us at veazievet@veazievet.com.